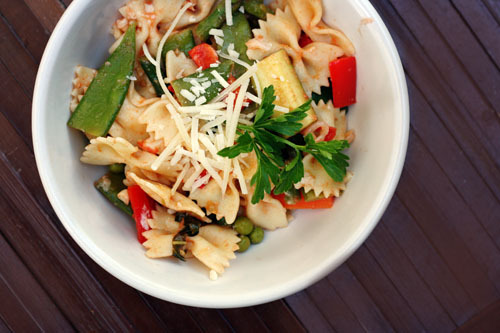 My friend Nikki made Pasta Primavera for us one night and it was divine. I couldn’t wait to get the recipe and she happily shared. It’s from the Moosewood Restaurant Low-Fat Favorites cookbook, which she said is her favorite of their books. If you want to buy it, click here. Let me warn you, this dish is a labor of love. Chopping all those vegetables takes time…especially if you add more vegetables than the recipe calls for like I did. But it is an excellent dish, is super healthy, and if you’re only feeding 4 people like me you will have tons of leftovers. Blanching the vegetables as indicated in the recipe makes for perfectly cooked veggies. One more quick tip…I had some Tuscan Tomato Soup leftover when I made this pasta. Pouring a bit of that soup over the pasta was oh so good. My friend Nikki discovered this fabulous and filling vegetarian recipe and shared it with me. I will be forever grateful to her! Bring a covered pot of water large enough to accommodate a colander or steamer basket to a boil (neither Nikki nor I have one of these setups, so we use a slotted spoon to scoop the veggies out of the hot water when it’s time). Meanwhile, saute the garlic and oil in a saucepan for about 2 minutes. Add the tomatoes, wine and salt and cook on medium heat for about 5 minutes. Add the basil and red onions, cover, and remove from the heat. When the water is boiling, blanch the vegetables. (If you prefer to steam the vegetables, allow 3 minutes between each addition of vegetables). Put the carrots in first. After 1 minute, add the asparagus and bell peppers (if doing snow peas, sugar snap peas and/or green beans, toss them in at this point). After another minute, add the zucchini (or summer squash) and peas. Cook for 1 minute more and then lift out the colander and all of the vegetables and set aside to drain. Reserve the pot of boiling water for cooking the pasta. Stir the vegetables into the tomato sauce. Add salt and pepper (if needed). Cover and set aside. Cook the pasta until al dente. Drain, reserving ¼ cup of the cooking water. Toss the pasta with the reserved cooking water and 3 tablespoons of the grated cheese. Top with the tomato-vegetable sauce. Sprinkle with the remaining cheese and serve immediately. I love the Moosewood cookbooks. Great healthy/fresh recipe! Oh my! That looks yummy! I may try it with whole wheat pasta, too! 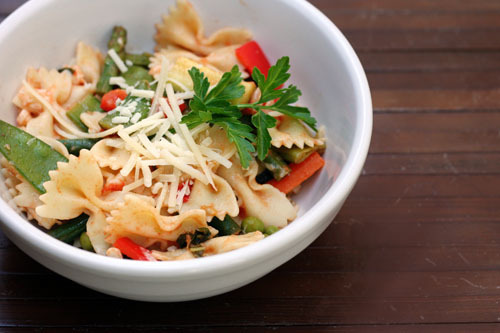 whole wheat pasta is a great idea! This looks so good, but I can’t see my husband liking it. I’ve gotta get him to start trying more things! My local library has several of the Moosewood cookbooks. They are great to check out, though I must admit, I always hate having to take them back. The Pretend Soup book for children is adorable. It is written by the author of Moosewood cookbooks. It is all about getting kids involved in cooking healthy food. I think you’d really like it! I have a well-loved copy of the Broccoli Forest cookbook, which says blintzes should never be eaten unless made by someone who loves you 🙂 I actually made the “broccoli forest” recently which I loved, although the kids not so much…wowed by the forest though 🙂 There are some interesting recipes, but also a lot of basic ones that allow you to really expand..quiches, stir-fry, souffles and some great salads. I just heard about this cookbook from danatreat.com sounds like a great one and we often eat vegetarian. 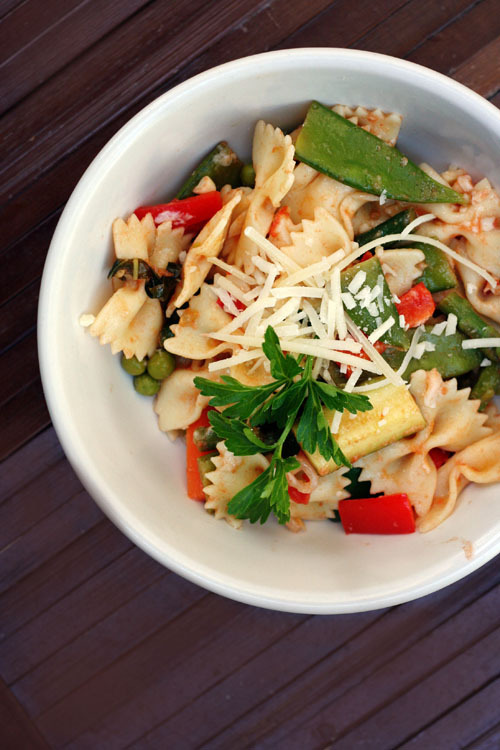 I could go for a bowl of that pasta for lunch right now! My favorite cookbook is currently “Vegetables Every Day” by Jack Bishop. It enthusiastically tells you how to select and serve the best and freshest of vegetables. A couple recipes are given for each vegetable to get you started. I have a goal to try one new vegetable every month this year so I can broaden my produce horizons. that sounds like a cool book…love the idea of sharing recipes for specific vegetables. very cool – I will check it out! I know Moosebook, back in the day at UCSB in the early 90’s. Did I just date myself?? I’m actually from Ithaca and have never been to the Moosewood restaurant! The next time I go back to visit my family, I need to try it!!! That friend sounds fantastic, and incredibly attractive. Do you have her phone number? Those are the most perfect and adorable I have ever seen! This looks so amazing and light! I’ve seen moosewood cookbooks but never bought one…they look wonderful! I have Moosewood Restaurant Daily Special, and I love the recipes. I often adapt them for my non-vegetarian husband by adding some grilled chicken or beef on top of a salad. Their house dressing is delicious! Moosewood is one of my favorite restaurants. I’ve only been there twice but I love it. (The food is fantastic, so I knew this was going to be good.) I’ve been really wanting to go there again soon. Have this cookbook but haven’t made this. Im making it tonight, though…thanks for the great idea! just found your site and absolutely love it. I made this last night and I decided to add some med. shrimp to the mix. AWESOME!!! My husband gave the thumbs up to make again. thank you. thank you so much – and I am glad the recipe was a success! shrimp sounds like the perfect addition – yum!